The FSAE Team will be participating in this year’ s homecoming parade on Friday, November 10th. Come and see the 2017 car! 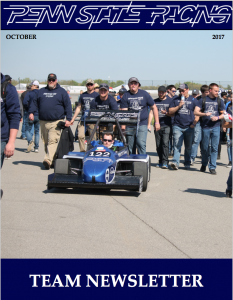 Catch up with Penn State Racing’s progress in the October edition of the team newsletter! 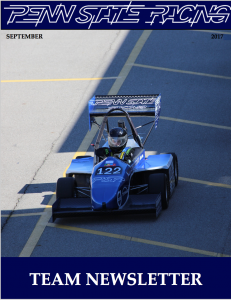 Penn State Racing has returned! The beginning of the 2017-2018 academic year marks a new chapter for our team. After a Summer dedicated to research and design work, we now turn our attention to the manufacturing of our 2018 vehicle. Many exciting changes are coming to this year’s car, the most significant being our transition to a carbon-fiber monocoque chassis. The new chassis aims to be lighter, safer, and more rigid than last years steel tube space frame. Please find the September Newsletter attached, which details our progress so far. Also, stop by the Learning Factory at any time to see the car or join the team! Stephen took the candidacy exams in Fall 2017 after joining the E-SOC lab in Spring 2017. He is currently conducting research on modeling and optimization of advanced powertrain systems with application to Connected and Automated Vehicles (CAVs). His research is supported by the ARPA-E NEXCAR Program. Penn State Racing team had the official vehicle unveiling on April 27th during the Senior Engineering Design Showcase at the Bryce Jordan Center. The team is ready for the SAE competition at the Michigan Speedway from May 10th to May 13th. Updates on the competition will follow soon. Congrats Kasra on Passing the Candidacy Exam! Kasra took the candidacy exams in Spring 2017 after joining the E-SOC lab in Fall 2016. He is currently conducting research on using model order reduction for deriving first-principles control-oriented models. The application of Kasra’s work is on three way catalytic converters for passenger vehicles. Thank you to Aaron Thomas for covering the story!